In the quest for greater home energy efficiency, modern windows, doors and insulation keep more outside air OUT, but that also keeps more inside air IN. So if you’ve got dirty or improperly sealed air ducts or if your home ventilation isn’t right, you’ve got a problem. The EPA says indoor air is typically 2-5 TIMES DIRTIER than the air outside. Dust, mold, pollen, viruses, bacteria, and toxins blow through your home air system, and everyone in the house is breathing it in. Regular air filters don’t help. They’re only designed to protect furnaces and air conditioners from giant dust dinosaurs, not the tiny molecules that can actually damage your health. Our whole house air cleaning options remove more than 97% of these dangerous particles and eliminate their threat to your health. You WILL breathe air so clean you will smell and feel the difference. Prevents costly water damage to your home, because it prevents unseen A/C PAN OVERFLOWS. Eliminates the bacteria, algae slime and fungal growth beneath your interior unit. Stops the offensive odors before they start. We CAN Eliminate Stinky Air! We remove the odors from pet and litter boxes, dirty diapers, burnt food, cigarette smoke and any other offensive attacks on your sense of smell. The powerful cleaning of our MicroPower Guard® and the Air Scrubber® (we like to call “The Smellerator”) neutralizes the harmful gasses, toxins, and fumes coming through your air system into your home. *The Smellerator’s combination of an electromagnetic force field and powerful UltraViolet light first trap dangerous particles and then create O3 oxygen scrubbers, nature’s way of cleansing the atmosphere. You’ll start smelling the difference the moment you turn it on and keep feeling the benefits as your home becomes a pleasant smelling wonderland. One Hour does Duct Cleaning the RIGHT way. Old school duct cleaning (sweeping the interior with a “rotobrush” etc) doesn’t work. It doesn’t really clean the ducts, but it does move a lot of pollutants around! But this is why we do it differently: we SUPERCLEAN your ducts. While cleaning your ducts, we use advanced technique and higher tech equipment along with safe cleaning agents, to cleanse every nook and cranny of your duct system, not just what you can see peering in. We do Duct Sealing the ONLY way that makes sense! The ol’ external duct tape or masting paste methods are messy, inefficient and far less effective; And they can only be applied to ducts that are physically accessible. But we’re the only company in town licensed to AEROSEAL your ductwork. AEROSEAL is the advanced method that super seals your air ducts from the inside. And it works like a miracle! Get a Complete Home Air Quality Assessment! We come to your home and thoroughly inspect your ventilation and air intake sources. To optimize air quality, the best possible level of ventilation must be established for your home. We’ll evaluate your home’s setup and suggest ways to achieve optimal air flow. We’ll also check all possible sources of air pollutants or dangers within your home, such as your heating system and your stove and if needed, suggest adjustments so that everything will operate properly and safely. 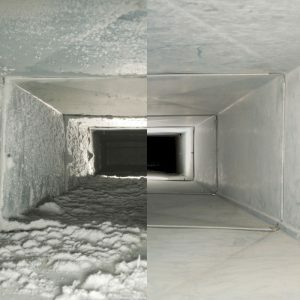 We check your air ducts for filth, air leakage or other issues. If there are any problems with your duct work we will give you ALL your options, because we are duct MASTERS.